Now for some sweet, sweet local co-op. 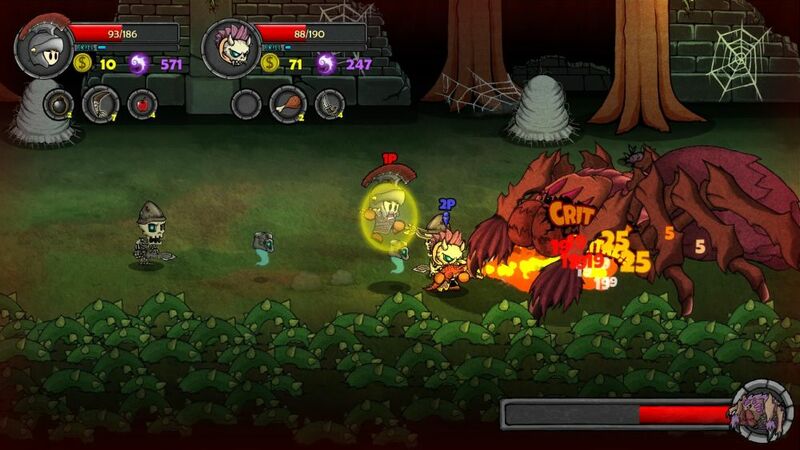 Two players can join up in Lost Castle, choosing between gamepad and keyboard controls. As you might have guessed, gamepad is the way to go. Players share a screen and the camera fights to keep both characters in easy view. Stages aren't very big, so you never really run into visibility or scrolling problems, even if you're trying to mess things up. There's no friendly fire, and if a player dies they can be revived by the other person in a fun micro-game-style interaction. 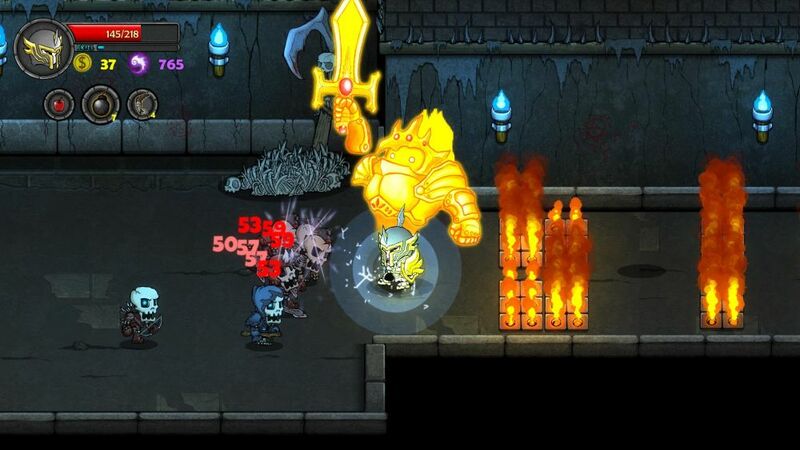 Looting is always a sore spot in co-op games, as it forces players to choose who gets an item and who has to suffer without. Lost Castle keeps all items persistent, meaning once a player picks something up, the other can't. Most item drops of note take place outside of battle, however, which gives you a moment to negotiate with your pal to see who needs what the most. Health pick-ups are common, throwable items reasonably so, and wearable items are rare. You won't have too tough of a time sorting the sharables, even if your interpersonal skills are lacking. The Lost Castle experience lasts for five stages, each containing a handful of areas to explore with a boss encounter at the end. Replay value is naturally quite high thanks to a fair amount of randomization along with class change-ups, loot variations, and overall enemy variety. Lost Castle does a great job keeping you busy, and its included co-op mode makes it a great party experience, even if that party only has two people. Downsides are nitpicky in nature, as pretty much everything works just the way it's supposed to. The dialogue is rough in a lot of areas, featuring typos, inconsistencies and awkward word usage. Lost Castle hits the sweet spot between familiarity and uniqueness. The game can be readily summarized with a couple of genre tags and comparisons to other releases, but when you sit down and play it you quickly realize there's more to it than that. The artwork is creative and catchy, the combat-centric gameplay is fluid without feeling overly complex, and the co-op does exactly what you need it to do: give you and your friends an excuse to beat things up and hoard massive amounts of loot. Page created in 0.8241 seconds.